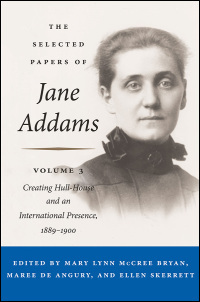 Just in time for Women’s History Month, the 3rd volume of Jane Addams’s papers, The Selected Papers of Jane Addams Volume 3: Creating Hull-House and an International Presence 1889-1900 is now available. Jane Addams, a young woman from Cedarville, Illinois, emigrated to Chicago in 1889 in hopes of a better life for herself and for others. 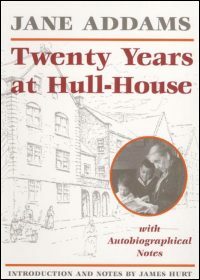 By 1900, Addams successfully established a social settlement called Hull House which marked the beginning of the American settlement house movement. Through her leadership, Addams advocated for both social justice and progressive reforms in the United States. She also helped establish women as leaders in many professions and campaigned for women’s suffrage. The University of Illinois Press is proud to have been publishing the Jane Addams papers and scholarship on Addams for nearly two decades. Check out all the volumes in the series, as well as some other works by Addams below. 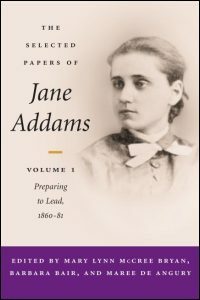 Venturing into Usefulness, the second volume of The Selected Papers of Jane Addams, documents the experience of Jane Addams, intellectual, social activist, and author between June 1881, when at twenty-one she had just graduated from Rockford Female Seminary, and early 1889, when she was on the verge of founding the Hull-House settlement with Ellen Gates Starr. During these years she was developing into the social reformer and advocate of women’s rights, socioeconomic justice, and world peace she would eventually become. In 1889 an unknown but determined Jane Addams arrived in the immigrant-burdened, politically corrupt, and environmentally challenged Chicago with a vision for achieving a more secure, satisfying, and hopeful life for all. Eleven years later, her “scheme,” as she called it, had become Hull-House and stood as the template for the creation of the American settlement house movement while Addams’s writings and speeches attracted a growing audience to her ideas and work. Nearly a century before the advent of “multiculturalism,” Jane Addams put forward her conception of the moral significance of diversity. 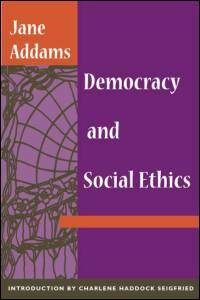 Each member of a democracy, Addams believed, is under a moral obligation to seek out diverse experiences, making a daily effort to confront others’ perspectives. Morality must be seen as a social rather than an individual endeavor, and democracy as a way of life rather than merely a basis for laws. Failing this, both democracy and ethics remain sterile, empty concepts. “We may either smother the divine fire in youth or we may feed it,” Jane Addams writes. 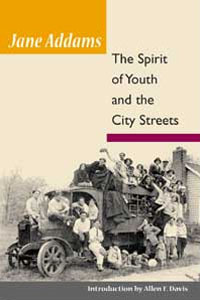 Suffused with Addams’s abiding compassion, tempered with her pragmatism and humor, and shot through with anecdotes of her own experiences with young people, The Spirit of Youth and the City Streets is a level-headed assessment of the challenges facing urban youth and the most effective ways to meet them.